What is Staphage Lysate (SPL)®? Staphage Lysate (SPL)® is a naturally derived product made up of staphylococcal cellular components, bacteriophage and beef heart infusion broth. It is the only staphylococcal product of its kind approved for canine use that can reduce the recurrences of staph skin infection and stimulate the immune system simultaneously. It is not a short-term medication but rather designed to help control the skin infection over time. Staphage Lysate (SPL)® Builds the Dog’s Own Innate Immune System. Dogs with compromised immune systems cannot rely on their innate immunity to protect themselves from staphylococcal skin infection. Staphage Lysate (SPL)® is believed to control pyoderma by enhancing the patient’s immune responses to staphylococcal species. Over the past 15 years, evidence from dozens of leading laboratories has shown that humans and animals have an “innate immune system” that allows the patient to react within minutes of exposure to several molecules that are present in pathogens (bacteria, viruses and fungi). Though these innate immune reactions are diverse and complex, most if not all of them are initiated, focused and/or sustained by the patient’s production of proteins called “cytokines.” SPL® contains several of the most powerful known stimulators of cytokines, including bacterial DNA, peptidoglycan, and lipoprotein. 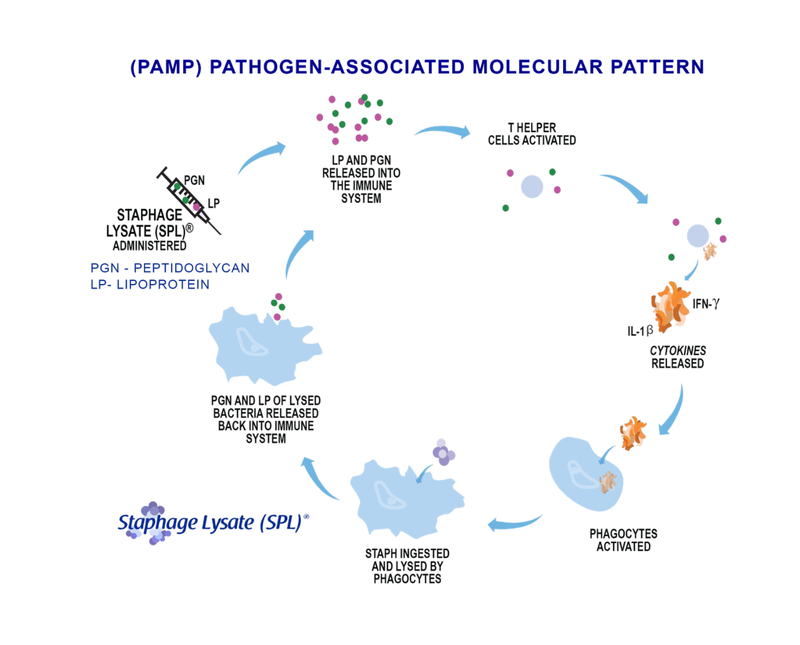 Numerous studies with SPL®, in both cell culture and animal models, have shown that SPL® rapidly stimulates production of cytokines. SPL’s® efficacy is believed to be due to its powerful ability to stimulate cytokines that enhance the patient’s innate immune reactions against skin-associated bacteria (including staphylococcal strains) that cause or exacerbate pyoderma. Administering Staphage Lysate (SPL)® allows dogs to boost their own defenses to provide continual protection against recurrent canine pyoderma. The below diagram demonstrates the proposed method of natural immunity stimulation and the effect of SPL®. When to Use Staphage Lysate (SPL)®. related staphylococcal hypersensitivity or polymicrobial skin infections with a staphylococcal component. It’s efficacy has been proven in dogs with a history of recurrent pyoderma that have been treated previously with antibiotics. A work-up should be conducted to rule out and/or treat any underlying conditions such as demodicosis, flea allergy dermatitis and hypothyroidism. In addition, SPL® has been shown to be effective in dogs with resistance to multiple antibiotics. Free consultations with our board certified veterinary dermatologist are available to veterinarians to answer any clinical questions and guide you through the treatment process. Please click here for contact information. What to Expect When Using Staphage Lysate (SPL)®. Staphage Lysate (SPL)® is approaching 30 years of successful clinical outcomes in treating dogs for recurrent skin staph infection. It remains the only product of its kind on the market that has been proven effective in controlling this condition. 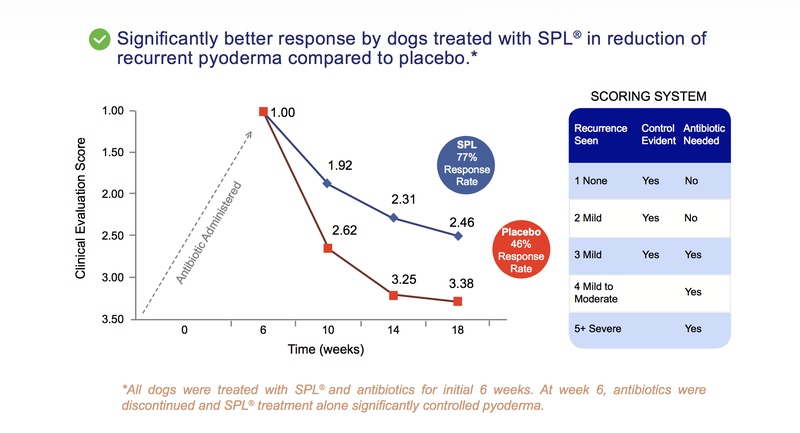 In a double-blind placebo controlled study, documented in the American Journal of Veterinary Research1 , SPL® demonstrated a significantly better response by dogs treated with Staphage Lysate (SPL)® in the reduction of recurrent skin staph infection compared to placebo. In fact, the difference can be seen as early as 10-12 weeks, shortly after the time that a 4 to 6 week regimen of antibiotics wears off. Side effects are very few. Sometimes reactions at the site of the injection (i.e. redness, itching and/or swelling) may occur in 2 to 3 hours and may last up to 3 days. Rarely, SPL® may cause general vaccine type reaction (i.e. malaise, fever and/or chills). If excessive, these reactions may be lessened by dose reduction. There are no known contraindications except that in highly allergic patients reduced doses may be indicated. Dosing and Administration of Staphage Lysate (SPL)®. Therapy with Staphage Lysate (SPL)® is initiated at the time of the diagnosis of skin staph infection. Antibiotic therapy is usually started concomitantly for the initial 4 to 6 weeks, although the use of antibiotics and length of time can vary widely based on the severity of the condition as well as the dog’s response to antibiotics. Once the effects of antibiotics wear off, the beneficial effects of SPL® continue to work for ongoing protection against staph skin infection. Since this product has been developed for long term control, it is not a short term treatment . Staphage Lysate (SPL)® is administered by subcutaneous injection. The dose size is 0.5 ml. for almost all dogs, with adjustments sometimes for extremely small or large dogs. See package insert for Allergic Patient Dosage Schedule. The regimen is straightforward and begins with initiation doses followed by maintenance doses. A typical regimen begins with twice weekly treatment for the first 10-12 weeks. If a beneficial response is seen, injection intervals can be slowly increased over a 3 to 6 month period until an effective maintenance dose is achieved. The maintenance dosing begins with once weekly. If the dog continues to be free from symptoms, taper off to bi-weekly booster shots and then once every 3 weeks. Continue this process based on the dog’s response. If the dog begins to show symptoms, return to the initiation dose and titrate down to the level where the dog did not show symptoms. This will be the maintenance dose. The use of SPL has not been shown to affect adversely other treatment modalities, although the concomitant use of systemic corticosteroids is not advised. Free consultations for veterinarians with our board certified veterinary dermatologist to guide you through the treatment process. Please click here for contact information. Staphage Lysate (SPL)® is available in 10 ml multi-dose rubber stoppered vials. The combination of initial and maintenance regimens requires an average of 2 ½ vials per dog for the first year. SPL® can be purchased directly through Delmont Laboratories or through an authorized distributor (US), buying group (Canada) or importer (Brazil, Israel and United Kingdom).